Park in the gated motor court w/ golf cart garage. MLS#3496341. Dickens Mitchener & Associates Inc. Oversized deck surrounded by a peaceful natural setting, ideal for morning coffee and entertaining. MLS#3498803. Helen Adams Realty. Seven Eagles - 2 car detached garage & electric gate. Gated community. MLS#3497795. 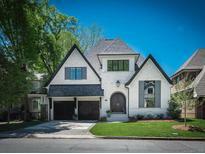 Dickens Mitchener & Associates Inc.
Myers Park Manor - One of a kind home that you do not want to miss! MLS#3497456. Dickens Mitchener & Associates Inc. This home is a must see! MLS#3494454. Costello Real Estate and Investments. Just a short drive to Uptown. MLS#3494394. Genevieve Williams Real Estate LLC. Don't miss the beautiful sunroom downstairs that opens to a spacious deck and fenced in back yard. MLS#3498800. Cottingham Chalk. Just a short drive to Uptown. MLS#3495276. Genevieve Williams Real Estate LLC. And you'll die for the owners suite featuring walk-in closet, dual vanity & stunning tile wet room! MLS#3470775. Savvy + Co Real Estate. Woodburn - NEW FLOORING/FRESHLY PAINTED,NEW LIGHTING AND ELECTRIAL OUTLETS TO BE INSTALLED INMAIN HOME. Private well and septic. MLS#3499261. Elite Team Realty. Walk to Providence Day and Fresh Market. MLS#3498078. Allen Tate SouthPark. Master Bedroom w/ Trey Ceiling, 2 Large Walk-in closets MLS#3498725. Helen Adams Realty. Bring all offers. Home is being professionally measured. MLS#3498135. Wilkinson ERA Real Estate. Poke your head in the garage and notice the walk up storage! MLS#3498999. Keller Williams South Park. Elizabeth Heights - We love the very large kitchen overlooking the private backyard and we love being in the middle of the City!" Pet Friendly Street! MLS#3499368. Helen Adams Realty. Cameron Wood - Neighborhood swim & tennis club for additional fee. MLS#3499341. Cottingham Chalk. Arboretum Crossing - PLUS Convenient to Top-Rated Public & Private Schools! Welcome Home! MLS#3498818. Allen Tate SouthPark. Known for their energy-efficient features, our homes help you live a healthier and quieter lifestyle while saving thousands of dollars on utility bills. MLS#3499195. Meritage Homes of the Carolina. Old Stone Crossing - Close to hwys & shopping. COME CHECK IT OUT! MLS#3497604. Keller Williams Ballantyne Area. A cool sanctuary perfectly suited to a relaxed life-style awaits. MLS#3498264. Keller Williams South Park. Known for their energy-efficient features, our homes help you live a healthier and quieter lifestyle while saving thousands of dollars on utility bills. MLS#3499179. Meritage Homes of the Carolina. A cool and airy sanctuary perfectly suited to a relaxed life-style awaits. MLS#3498343. Keller Williams South Park. Expanded parking area and great storage throughout. MLS#3496425. Savvy + Co Real Estate. Ask about our Main Street Star Discount! MLS#3499305. DR Horton Inc.